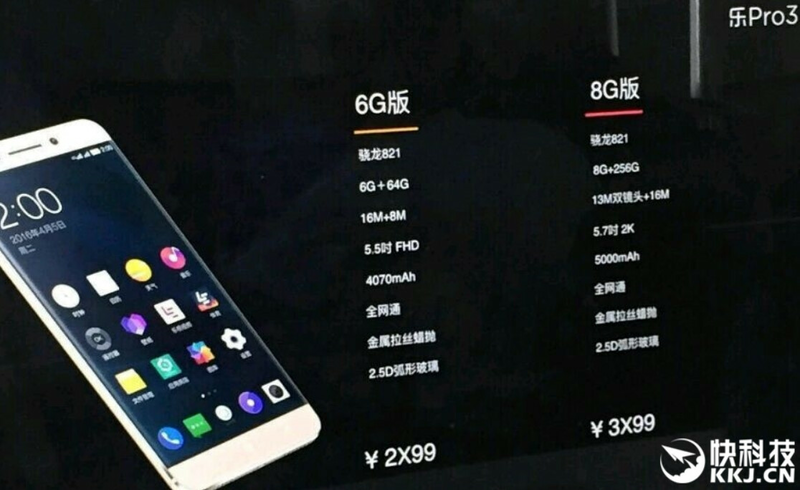 Internal training document reveals variants of the LeEco Le Pro 3 with 6GB and 8GB of RAM? An internal training document for the rumored September 21st unveiling of the LeEco Le Pro 3 reveal two different versions of the phone. The first features a 5.5-inch screen using 2.5D glass, with a 1080 x 1920 FHD resolution. The Snapdragon 821 SoC will be under the hood carrying a quad-core CPU and the Adreno 530 GPU. 6GB of RAM is inside along with 64GB of native storage. A 16MP camera graces the back of the phone, while an 8MP front-facing camera takes selfies and handles video chats. Keeping the hamster wheel spinning will be a 4070mAh battery. The premium version of the LeEco Le Pro 3 comes with a 5.7-inch display carrying a 1440 x 2560 QHD resolution. The Snapdragon 821 SoC powers the phone, equipped with a quad-core CPU and the Adreno 530 GPU. 8GB of RAM is inside along with 256GB of native storage. There will be a 13MP dual camera setup in back, and a 16MP front-facing snapper. A massive 5000mAh battery keeps the lights on. The regular model with 6GB of RAM will be priced somewhere between the equivalent of $314.16 USD and $448.86 USD. The premium version with 8GB of RAM will be priced in a range of $463.83 USD and $598.53 USD. Even though LeEco is known for stuffing its high-end handsets with some mouth watering specs, we do suggest that you take this story with the proverbial grain of salt. An x86 phone needs to run an x86-capable OS, in order to make full use of it. Could be Surface Phone, but I wonder if Google is gonna release an x86 version of the Android. And I doubt than an x86 phone will end the spec wars. If Google releases Android x86 for smartphones, that would be pretty enticing. Google have supported x86 for some time, since Lollipop iirc And there have been numerous x86 phones released, the first one that comes to mind is the Motorola Razr i, with the most well known being the Asus Zenphone 2, and numerous others with Atom chips, before Intel pulled the plug on them. Someday smartphones will surpass PCs in specs. Android smartphones with Quad-core 2.4GHz and 8GB RAM doesn't worth crap, because it's still a RISC CPU, and ARM SoCs are nowhere near the x86 CISC ones in PCs! Smartphones specs will never surpass the specs in PCs. I mean, the latest Intel Core i7 SoC is far, far above the latest flagship SoCs in smartphones. 821 8GB 256GB 2K 5000mAh QC3.0 Wow! if it has OLED display and good ram & battery management then LeEco is doing some really good job, better than OnePlus I would say.